John Weiss’ favorite theme of companionship is beautifully realized in "Autumn Friends." Brilliantly combining colors and textures, Weiss creates an image that conveys emotion and humanity. 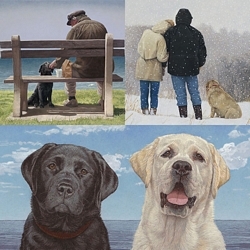 The pair of friends in this image may be familiar to collectors who have seen his series of Grady images, including "Old Friends," "Forever Friends" and "New Friends" — all Sold Out at Publisher. In "Autumn Friends," Weiss captures a man and his dog on a crisp autumn morning as they set out for another of life’s adventures together as faithful friends.